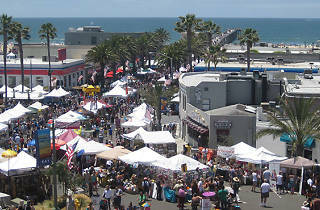 Photo courtesy Fiesta Hermosa Downtown Hermosa Beach. Roam the 400 stalls at this arts festival, sample the fine foods and listen to the music—and then take a dip in the nearby Pacific. Look out for the Fiesta over both Memorial Day and Labor Day weekends. Parking actually wasn’t atrocious like we had planned for. Obviously coming via bike might be a great idea; but as far as circling some of the roads in Hermosa in your car, that is to be expected on a regular day anyway, so you don’t necessarily have to park in the designated area and shuttle there. If you don’t mind walking you can find decent street parking. There was a ton of arts and crafts booths selling anything from seashells, baby clothes, jewelry, handbags, etc. 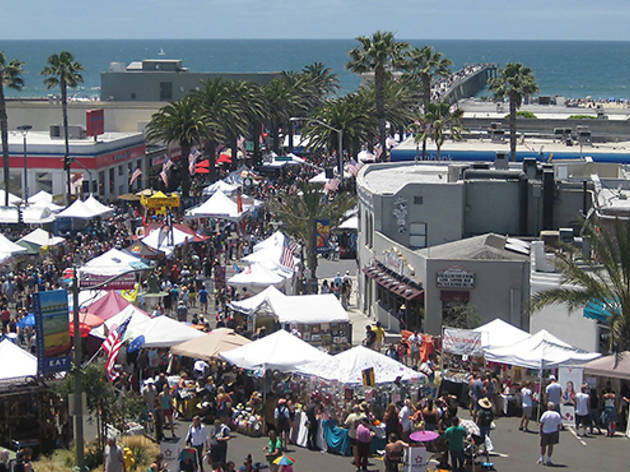 I wouldn’t necessarily go to this festival for the shopping, there’s better stuff to be found in the shops in the Manhattan/Hermosa area, but not bad to just browse. There was a petting zoo for kids and a whole area dedicated to food (Greek, Tacos, Hawaiian BBQ, etc) Typical fair food, nothing too outstanding. There’s live music blasting and while the food and shopping is not overall impressive, it’s still a fun thing to do and gives you a chance to enjoy the sun.